Jesus said, “My kingdom does not belong to this world” (Jn 18:36). Why, then, are many Christians today looking to politicians to restore all things in Christ? Only through Christ’s coming will His kingdom be established in the hearts of those who are waiting, and they in turn, will renew humanity through the power of the Holy Spirit. Look to the East, dear brothers and sisters, and no where else…. for He is coming. MISSING from nearly all Protestant prophecy is what we Catholics call the “Triumph of the Immaculate Heart.” That’s because Evangelical Christians almost universally omit the intrinsic role of the Blessed Virgin Mary in salvation history beyond Christ’s birth—something Scripture itself does not even do. Her role, designated from the very beginning of creation, is closely linked to that of the Church, and like the Church, is oriented entirely toward the glorification of Jesus in the Holy Trinity. Thus, she too shares in the triumph over evil, and in fact, is the gateway by which it comes—the gateway by which Jesus comes…. This Scripture was fulfilled with Christ’s birth—but not completely. Thus, Jesus continues to come to increase His reign, and soon, in a singular, powerful, era-changing way. St. Bernard describes this as a “middle coming” of Christ. Pope Emeritus Benedict XVI affirmed that this “middle coming” is in keeping with Catholic theology. So now we see coming into focus what the Flame of Love is: it is the coming and increase of Christ’s Kingdom, from Mary’s heart, to our hearts—like a new Pentecost—that will suppress evil and establish his reign of peace and justice to the ends of the earth. Scripture, in fact, speaks explicitly of this coming of Christ that is clearly not the parousia at the end of time, but an intermediate stage. The Flame of Love that is here and coming upon the Church is first of all the “brightness” of the coming of her Son that Our Lady herself is “clothed” with in Revelation 12. It is the brightness of a new dawn rising quietly in hearts, Christ “the morning star” (Rev 22:16). 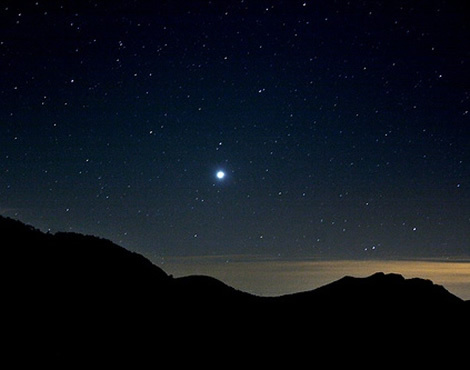 Jesus, who calls himself “the morning star,” says He will give to the victor “the morning star.” What does this mean? Again, that He—His Kingdom—will be given as an inheritance, a Kingdom that will reign for a time throughout all the nations before the end of the world. This breaking of Satan’s power causes him to concentrate into the “beast” what’s left of his authority. But whether they live or whether they die, those who have welcomed the Flame of Love rejoice because they will reign with Christ in the new Era. Our Lady’s triumph is the establishment of the reign of her Son among the nations in one flock under one shepherd. As it was through Mary that God came into the world the first time in a state of self-abasement and privation, may we not say that it will be again through Mary that he will come the second time? For does not the whole Church expect him to come and reign over all the earth and to judge the living and the dead? No one knows how and when this will come to pass, but we do know that God, whose thoughts are further from ours than heaven is from earth, will come at a time and in a manner least expected, even by the most scholarly of men and those most versed in Holy Scripture, which gives no clear guidance on this subject. We are given reason to believe that, towards the end of time and perhaps sooner than we expect, God will raise up people filled with the Holy Spirit and imbued with the spirit of Mary. Through them Mary, Queen most powerful, will work great wonders in the world, destroying sin and setting up the kingdom of Jesus her Son upon the RUINS of the corrupt kingdom which is this great earthly Babylon. (Rev. Therefore, brothers and sisters, let us waste no time in joining Our Lady and praying for this “new Pentecost”, her triumph, that her Son may reign in us, like a living Flame of Love—and quickly! Your tithes keep this apostolate online. Thank you. Posted in HOME, THE ERA OF PEACE.